TIGI’s Honeycomb Collector is a new type of solar thermal collector targeting high temperature differential applications. 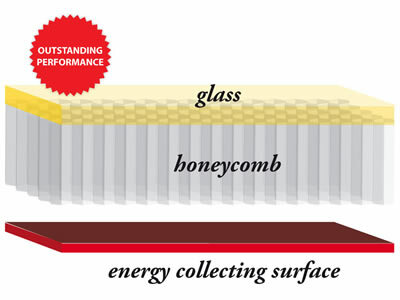 At the heart of the Honeycomb Collector is a polymer-made layer of transparent insulation (TI). 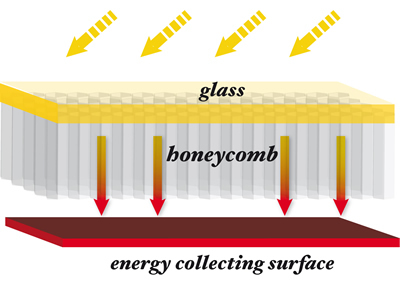 The TI honeycomb substance is transparent to solar irradiation, allowing for energy to enter the collector and heat the absorber plate. However, it creates a layer of air that cannot circulate, thus dramatically reducing losses related to convection – the major reason for energy losses and lower efficiency of flat plate collectors at high temperature differentials. 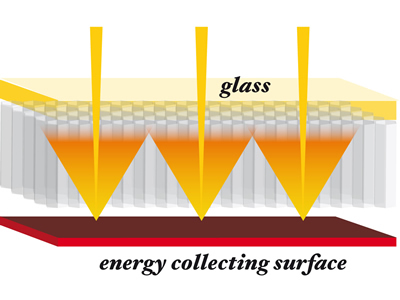 In addition, the polymer blocks back radiation in the infrared, further reducing energy losses. 1. Sunlight passes through the Transparent Insulation, heating the energy collecting surface. Solar energy, in the form of heat, is trapped and stored in a water tank and can be used later locally. 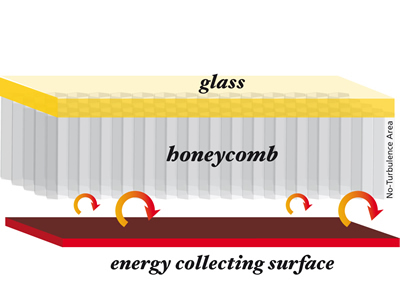 In addition to the low energy losses, the Honeycomb Collector does not necessarily need direct sunlight in order to function and can generate energy from diffused light as well, as on hazy or cloudy days. This makes it a particularly attractive solution in the cold and temperate climates of the developed world, including much of Europe, North America and colder parts of Asia. If not taken care of, the Honeycomb Collector's high efficiency could result in overheating of the collector and system components under extreme conditions, including stagnation when heat transfer fluid flow is insufficient. TIGI has solved this problem with a unique & proprietary integrated overheat protection device which releases heat to the environment at the collector level above a preset temperature. Honeycomb Collectors are extremely efficient in high temperature differences – heating water to high temperature differential from ambient. Hot water generated by TIGI’s products can therefore also be used to serve space heating or industrial process heat as well as to cool spaces in the summertime (by absorption chilling devices that are capable of converting the thermal energy into space cooling).